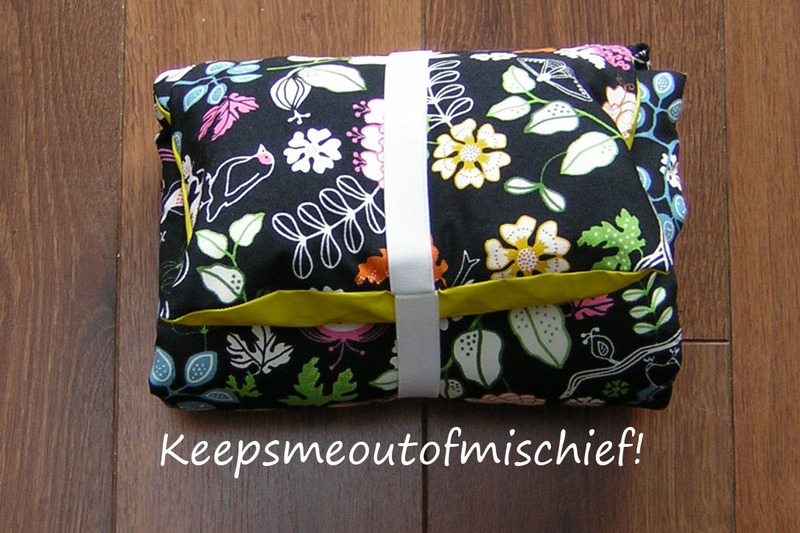 Roll Up Nappy Changing Mat | Keeps Me Out Of Mischief! I’ve started to make myself a few bits for when our baby arrives while I can still reach the sewing machine round my ever increasing bump! One piece of advice that I’ve been given is to have somewhere to change baby both upstairs and downstairs in the house so that I don’t spend my entire life trolling up and down the stairs with a baby. I’d already made a nappy changing mat for a friend some time ago, but I wanted to have a o at a slightly different design which had a bit more padding to make it more comfortable for baby. This design rolls up more easily so that it’s quicker to pack up and throw in the basket of the pushchair if I want to go out. I’d looked t shop bought versions of this and decided I could easily make this and have it in a much prettier fabric. Both of these fabrics are from Ikea. The black patterned fabric is a medium weight cotton and the yellow fabric is a light weight oilcloth, both are machine washable – something which will no doubt be important! I made the lined pocket at the top first. It’s just the right size for a packet of baby wipes, a couple of nappies, a couple of nappy sacks and a little pot of Sudocrem. I then made the main body of the mat, I quilted it into three sections to stop the wadding from moving around of bunching up inside. I then added the loop of elastic before I sewed it altogether. It’s actually quite compact when it’s rolled despite having a full packet of baby wipes in it. I’ve just noticed that it will roll under the sofa – think that’s where it’ll end up being ‘stored’!